A leave in conditioner that feels light and smells awesome? 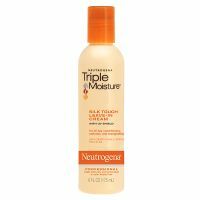 This drugstore wonder by Neutrogena does an incredible job on my thick dry hair. It brings out the waves without leaving it greasy or heavy, and it smells absolutely amazing, both fruity and coconutty. When I am done with the bottle, I will probably purchase it again. This is a bit heavier than many leave-ins I've tried, so I would recommend it for pretty dry, thick hair. It absolutely gives my hair added moisture without weighing it down or making it greasy. I use about 2 dime size dollops scrunched throughout my hair. All the oils really deliver! Also, it smells GREAT. Really cheap and does a great job! This really works, and a little goes a long way. Smooth a little bit of this on your ends and you're good to go! It's also a good idea to coat your ends with this before you flat iron- the results are beautiful, really smooth and shiny.